A base component of the Kaltura library bridges the gap between the few browsers that don't support HTML5, by falling back to its underlining Flash player. It works by playing the HTML5 video, only if the browser supports it. If it doesn't, it will fallback on Quicktime, and if there is no Quicktime installed it will fallback to Flash. Finally, if all else fails, a placeholder image is shown and the user can download the video using the links provided. 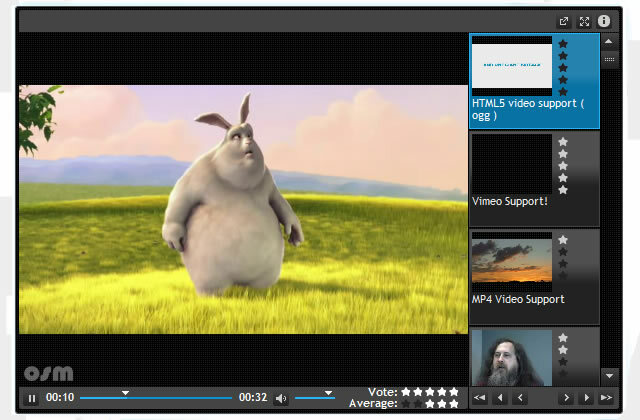 The Open Standard Media Player (OSM) is an open source (GPL – license free) fully featured media player written in jQuery that can dynamically play any media thrown it's way, whether it be HTML5 video – Flash video – Audio, etc.